And it was a good night for RTÉ. It was a memorable night for all involved. IN THE BUILD-UP to last night’s crunch Euro 2016 Qualifier, Niall Quinn admitted Martin O’Neill’s side needed to produce something that would capture the public’s imagination again. With the Rugby World Cup very much in the nation’s sporting conscience, Ireland delivered the goods last night to record a historic victory over the world champions and send the country into delirium. For the 50,604 fans lucky enough to be inside the Aviva Stadium, it was an occasion they’re unlikely to forget in a hurry – and there was also a huge television audience tuning in to savour the achievement. Viewing figures for RTÉ’s coverage of the 1-0 win over Germany have been released and, as you would expect, they’re through the roof. An average audience of 786,600 people tuned into the game, which is a 48.73% market share. The audience peaked at more 1.1 million as the match reached its conclusion. Throughout the course of the broadcast, including the post-match analysis featuring John Giles, Liam Brady and Eamon Dunphy, almost 1.6 million viewers tuned in. 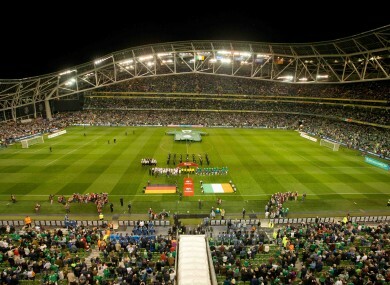 In addition to that, 71,655 watched the match live via the online RTÉ Player. While impressive, the All-Ireland final between Dublin and Kerry last month remains the state broadcaster’s match watched show this year. An average of 875,300 tuned in to see Jim Gavin’s side lift the Sam Maguire. Email “The television viewing figures from last night's historic win have been released”. Feedback on “The television viewing figures from last night's historic win have been released”.